As a nursing student in the late 70’s, one of the things we were taught was because we would be standing for such long hours we needed to elevate our legs and then put on our nursing stockings. They were thick, compression stockings, and took some time to pull them on. But after a long day of walking around, helping patients up and down from their beds, walking them in the halls and making sure all 18 of them had everything they needed when I returned home and took my stockings off the feeling of blood flooding my legs was interesting. Whether recovering from treatment, for prevention, or promoting efficient blood flow, wearing medical-grade compression stockings promotes healthy blood flow and reduces swelling, bruising, and soreness for people with varicose veins. 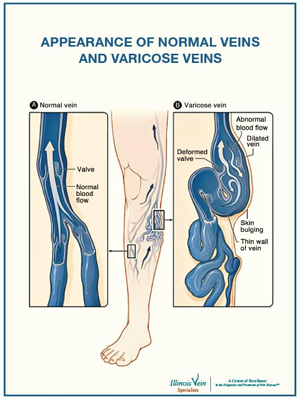 Wearing a Compression Hose is the very first step to vein treatment. A lot of patients who come into Illinois Vein Specialists to receive vein treatment think they will be able to get treatment immediately or very quickly from their first consultation. The benefits of treatment is that it is a medical procedure and is covered by insurance. However, some insurance companies require wearing a compression hose for 6 weeks to 3 months (depending on the insurance company) prior to receiving treatment.